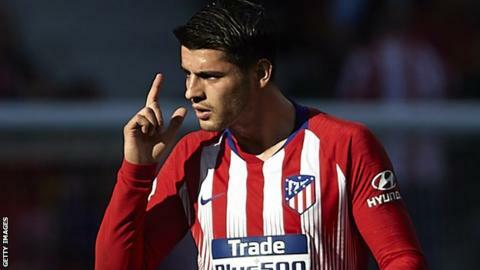 Alvaro Morata scored his first Atletico Madrid goal as they beat Villarreal. The striker, on loan from Chelsea, met Filipe Luis' left-wing cross with a low volley from near the penalty spot. He celebrated by pretending he was speaking to a video official, having been denied goals by VAR against two former sides - Juventus on Wednesday and Real Madrid on 9 February. Saul scored a late second as he ran on to Diego Costa's long ball to lob Sergio Asenjo from eight yards out. Atleti are seven points behind La Liga leaders Barcelona, who beat Sevilla 4-2 on Saturday. They could have won by more, with substitute Costa missing a one on one and Jose Maria Gimenez having a header saved. Attempt blocked. Alfonso Pedraza (Villarreal) left footed shot from the left side of the box is blocked. Attempt missed. Álvaro González (Villarreal) right footed shot from outside the box misses to the left. Assisted by Mario Gaspar. Attempt missed. Vicente Iborra (Villarreal) left footed shot from the left side of the box is too high. Assisted by Gerard Moreno with a cross.